I am a goal setter. I like to work towards a goal I have set for myself or for our family. It helps me. These days of up before dawn, working the tiller and planting the garden as well as all our other chores are exhausting, but rewarding. We can happily watch the fruits of our labor grow and eventually eat or save the yield. I adore having a garden, even though it is a tremendous amount of work. So this brings me back to my point. I have been making sure to get in some time for handiwork in the evening, no matter how tired I am. I find it relaxing and it does help me wind down from a long hard day. I am far from being a pro, but I am thinking I will begin to branch out some and try some new things. I believe this is a good way to practice preparedness. Learning life long skills that you need not any mechanism but your own two hands, some yarn and some needles. No electricity needed, you can sit by the light of a lamp and you can produce something beneficial. I wish I had taken pictures of yesterdays progress, it would be great to add to this post, but I will save it for another time. As for now, it is still quiet and somewhat early. 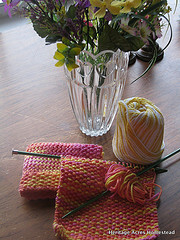 I believe I have a little time to go and pick up my needles, have my morning coffee and get ready for another day. I'm taking part in Homestead Revival's Preparedness Challenge. Lovely. What pattern did you use for knitting? I know how you feel about gardening and the hard work it takes. The benefits outweigh the work in my eyes. There is nothing thast can compare to going to the pantry or freezer and pulling out something you grew and preserved yourself. A blessing indeed!